Multi layer Frequency Reuse Pattern in GSM, multi layer reuse pattern, frequency, interference, technology, reuse density receives, frequency carrier uses. Multi-layer reuse pattern technology means to divide the whole frequency resources into different subgroups according to specific principles. Each subgroup allocates frequency carriers to every cell by means of different reuse models, so the reuse density of each frequency carrier as well as the interference will be different in each cell. The frequency carrier with higher reuse density receives less average interference, while the frequency carrier with lower reuse density receives more average interference. For example: BCCH frequency carrier uses 4*3 reuse mode, TCH frequency carrier uses 3*3 and 2*3 mode. 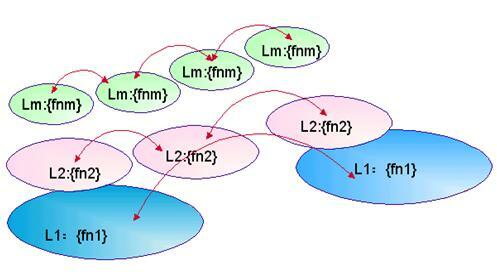 The structure of Multi-layer reuse pattern is illustrated in the above figure. One color represents the same group of frequency in the figure, and the frequencies are reused. L1, L2…Lm represent frequency layers in the cell. As seen in the figure, the reuse density becomes more close on higher layer. When the frequency number is fixed, Multi-layer reuse pattern gains more channels in unit area compared with same reuse density on each layer. Multi-layer reuse technology requires equipment which supports baseband frequency hopping or radio frequency hopping. It is created on the idea of carrier layering (in fact, single frequency reuse model is the exception of Multi-layer reuse pattern and it can be regarded as layered reuse with same carriers on each layer). That is to divide all available frequency carriers into several groups, each group serves as a carrier layer (frequency subgroup). Suppose that the whole frequency resource consists of n frequency carriers which falls into m groups, the carrier resource allocated to each group is shown in the above .